Your special day deserves a special venue! 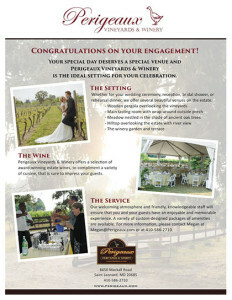 Perigeaux Vineyards & Winery is the ideal setting for your celebration. Whether for your wedding ceremony, reception, bridal shower, or rehearsal dinner our newly renovated tasting room with wrap-around porch offers beautiful views of our stately vineyards and manicured grounds. Our tasting room and grounds can be customized for your individual needs. Several different venues are offered on the estate. See below, or open this flyer for more venue information (PDF). of the vineyards, orchard, and sunsets over the vines. is nestled in the shade of towering ancient oak trees. roses and lavender, and the Provencal fountain surrounded by geraniums. We offer a selection of award-winning estate wines to compliment a variety of cuisine that is sure to impress your guests. A variety of custom-designed packages of amenities is available. Our welcoming atmosphere and friendly, knowledgeable staff will ensure that you and your guests have an enjoyable experience. Click on the flyer to download our wedding information. Bring the printout to our tasting room for a free tasting for you and a guest along with a personal tour of our facilities. To see more photos of our venue and read more info, download this PDF. For pricing and more information, please contact our tasting room at (410) 586-2710 or click here and fill out the form and we’ll be in contact with you. Several photos from this page courtesy of Danny Douglas Photography & David Krankowski.